Fancy Bands™Custom Themed Angel Garters or Custom Themed Cupid Garters are in white lace with a silver or gold metallic Fancy Band™ and sheer metallic bow. 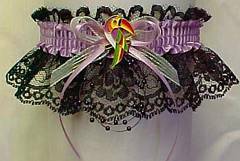 A matching Angel or Cupid charm is attached to the garter. 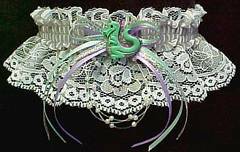 Custom Themed Fantasy Dragon Garters or Custom Themed Toucan Garters are available in white or black lace with a multiple satin bow with tails. A Dragon or Toucan is attached to the Custom Themed Garters. BettyBoop type Garters available in black or white lace. Betty Boop Garters will be shipped as shown, in black lace unless otherwise stated. Take advantage of the bridal garter selection. Keep the prom garter tradition.